The Council to Advance Hunting and the Shooting Sports released results from the first-ever National R3 Symposium. The document, released with the help of D.J. Case & Associates, highlights key takeaways from the Symposium which focused on resources and partnerships needed to secure the future of hunting, angling, target shooting, and boating in the United States. The event occurred on May 21-23, 2018 in Lincoln, Nebraska, and attracted over 325 individuals representing more than 40 states and 100 different organizations. 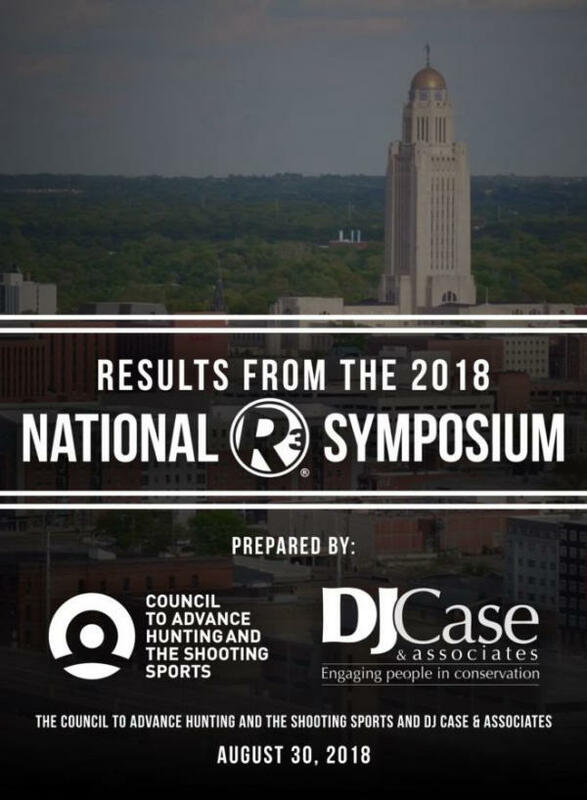 The response to the National R3 Symposium was overwhelmingly positive and demonstrates that a broad diversity of people and organizations are invested in the future of outdoor recreation and conservation. The event provided an unparalleled opportunity for agencies, industries, and NGOs to share, learn and develop possibilities the conservation community now has to accelerate the current state of R3 effort and impact. “As a community, our collective goal is to increase participation in outdoor recreation, and the process to reach such a lofty goal requires not only the dedication of significant resources but further, a steadfast commitment to reviewing and adjusting the way the community manages some of its most valuable resources – the participants themselves,” said Samantha Pedder, Director of Business Development for the Council. Through facilitated work sessions, titled “21st Century Business Practices” and “Evaluating R3 Impact Through Strategic Partnerships”, the Council and D.J. Case & Associates were able to identify three potential areas of constraint for future R3 efforts. These include direction for R3 coordinators and their efforts, support and priority placed on R3 efforts, and finally a continued centralized national effort. In addition to the facilitated discussions, the Symposium provided the opportunity for all four state fish and wildlife agency regional R3 committees to meet simultaneously and identify areas of significant need to advance R3 efforts at the state and regional level. Moving forward, the Council will work with the regional committees to prioritize these needs and then begin to facilitate opportunities to address them directly. The outdoor community has an increased understanding of the current state of R3 efforts at all levels of implementation (state, regional, and national). Current challenges in R3 are identified for the community to move forward to address. Partnerships are strengthened among all levels of the community, with a refined focus on opportunities to engage and address R3 together. Professionals further enhance and begin to implement strategies to address current R3 challenges (i.e. learn to evaluate programs; better understand an element of the National R3 Plan, etc.). Over 50% of survey respondents confirmed that the National R3 Symposium achieved the first three expected outcomes. The fourth outcome focuses on implementation and next steps in R3, which the Council is excited to address by convening a National R3 Implementation work group consisting of R3 professionals from state and federal fish and wildlife agencies, non-government organizations and industry partners. This group is expected to develop recommendations based on the results of the National R3 Symposium to address the constraints identified and develop the necessary capacity to effectively address these needs.